The Byron Parklands site continues to improve as a festival venue. The organisers are continually striving to minimise impacts to nearby residents and to maximise benefits within the site boundaries and the last falls festival showed this commitment. However, now external issues are being resolved, its time for internal challenges to be overcome. Periodically, I’ll ask a question to the organisers and will share their responses next issue. The noise impacts on nearby residents have improved greatly. The organisers made the decision to place the second amphitheatre stage under a tent- this made the space far less appealing for patrons, but kept noise down for nearby residents. A decision such as this was monumental for an event organiser and they should be congratulated for doing so. They also utilised huge bales behind every stage to cloak the sound and these all seemed to work well. Complaints across the board were way down in regards to noise. Can you commit to not having buses in Jonson st and work with Council to ensure this does not occur again? The huge bins were an improvement and certainly in the first few days seemed to work well. They made it easy to separate waste for later recycling. The ability for campers to ‘bring out their waste’ was enhanced and seemed to work well. However, as the festival went on a few problems became clear. Locations of bins needed tweaking. Some needed to replace ever overflowing small bins, especially in front of toilets where people quickly finish their drink in the line before hitting the loo. There were simply not enough in the main valley amphitheatre. In fact, there did not seem to be one across the entire top half of the area. Also, people started putting the lids down and using the only ones that were there as seats- this made using them impossible and huge piles grew in front of them. Watching someone slip on and fall amongst hundreds of beer cans whilst trying to walk along the path in front of the bins in the dark was a pretty ordinary sight. Lastly, it seemed the nearby stalls started using them incorrectly and huge amounts of boxes began to fill the can bins as the days went on. A spot for a cage bin? After each day, the clean up was impressive and certainly the residual waste after the event was collected and taken off site extremely quickly and efficiently. However, during each day, the site was strewn with empty cans- collecting them at the end of each day is OK, but not using them in the first place is truly sustainable. Bottom line- people are paying big money to have a great time, they deserve better than having to walk over a sea of beer cans in the amphitheatre and in high use areas. Though this is pretty normal for most big events- Falls and other Byron events could lead the world in creating a new level of experience. Pickathon Festival provides peg boards where you can personalise your cup, leave it and use it when you want. Bona Nit in Barcelona serves drinks in reusable cups, handed free of charge to the audience upon entering the Poble Espanyol. Bonaroo Festival’s Refill Revolution encourages patrons to use high-quality reusable water bottles and beer cups. Their mantra? Drink, Refill, Repeat! The water bottle was a limited edition Bonnaroo water bottle available at all concessions stands and participating vendors for only $5 that could be refilled at any water source on site. Participating vendors also accepted the bottles to fill with beverages they sold. Refill Revolution beer cups were sold for $15 at all locations where draft beer was sold. The price included the cup, the holder and carabiner and an ice-cold beer! Then, each subsequent beer that the patron bought with their reusable cup was $1 off. It diverted 400,000 plastic water bottles and 30,000 beer cups from landfill. Stack-Cup at Jelling Music Festival (Denmark). 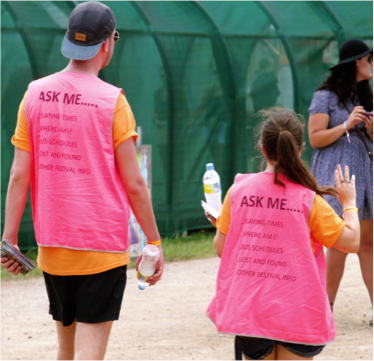 Have you investigated banning all cans and water bottles and instead issuing an aluminium or steel cup that can hook onto clothing or a belt and be cleaned and reused over the festival? With a printed on falls/splendour image, it could become a souvenir and would eliminate cans. In 2013, 2.5 tonnes of green waste was composted. This seems a touch low, though a great start. If served in compostable plates and with compostable cutlery-all could go into a compost bin. Oh, it was awesome to hear that hundreds of kilos of food stuffs were donated to Liberation Larder- nice one. How much was composted this year? Can we have compost bins next to all waste bins in the food court area? Are food vendors all forced to use biodegradable/compostable plates and cutlery? Have you considered purchasing all of this yourself, selling it to all the vendors (more cheaply than they can get it due to economies of scale), making it bit yourselves and ensuring all plates, bowls and cutlery is compostable? Even with some spaces the lack of care was startling. For example, the Kokomo bar on the ridge, by 3 pm on the last day was woeful. Hay bales that had been used as seats had collapsed into heaps- they weren’t then spread over the ground as flooring or removed-just left there. This was also the case the day before. The litter inside the area was also shocking-all the while as 4-5 bar staff stood idly by watching patrons dance. I’ve worked in hospitality and put on my own events enough to know that staff and an event should be striving to be as people friendly, caring, respectful and efficient in the last hour or day as the first. That is one of the way an event should measure itself. I had friends whose first day was on the festivals last and they felt they had walked into a house party in its last hour, which didn’t feel especially special when glammed up and excited. Granted it was bloody hot. Staff must have been pretty shredded by the last day; however, again, that comes down to staffing management and commitment to excellence. If waste, toilet and security managers were constantly patrolling the site, much of the problems I’ve listed who have been minimised. Can you create a few static ‘Ask Me’ stations along the thoroughfares-especially for night time? The options for food were great. Generally the stalls looked great and prices and quality were cool. It was awesome as always seeing local stalls rocking it to a national audience and succeeding-no real surprise, as after all, our rich market and festival tradition means we do it well. There were however, plenty of non-local stalls. Obviously plenty of local food vendors would have gone up to Woodforde, however, when there were still a few ordinary, generic non-local food stalls. I hope all the local food vendors who wished to trade at Falls could do so. Did all local food vendors who applied for a spot obtain one? If not, and if the reason was due to a lack of polish in presentation of their stall, is there anything in place to try and assist them so they can join the food family next year? As you will know, I am a massive fan of the commitment of the NBP crew to continually add more compost toilets. They are truly world leading in this area and deserve some huge congrats for it. This is a fair bit of tweaking and adjusting to do however. Once, when I went and checked the stand of them near the general store one afternoon, about 6 or 7 out of about 10-12(?) were dysfunctional-either with locks broken, or with no sawdust. The stand atop the amphitheatre also had massive odour issues and regularly no sawdust. The high temperatures would have made the compost nature of the loos really difficult and no doubt plenty will be learnt. Simply tripling the depth of the sawdust holder would assist, as would more regular monitoring. It is fantastic to see how the thousands of trees already planted are connecting the wildlife corridor. It is impressive. 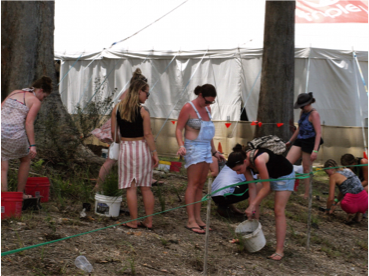 Also impressive is coming across teams of festival goers volunteering some of their time planting more trees within the site, especially along roads, watercourses and gullies through the planting of suitable vegetation to minimise erosion. It was also impressive to see how the site handled significant rainfall. As we all know, it bucketed down early on News Years Day, yet when I walked the site that same afternoon it was hard to find a puddle. How the stormwater drain litter traps etc all worked to ensure the nearby nature reserve was not impacted will be known soon, but certainly within the site, the rain caused very little negative impact. Carbon offsets were again offered. Some of the proceeds go to Climate Friendly investments in the Mali Cookstove Project in Mali- which is so incredibly important. 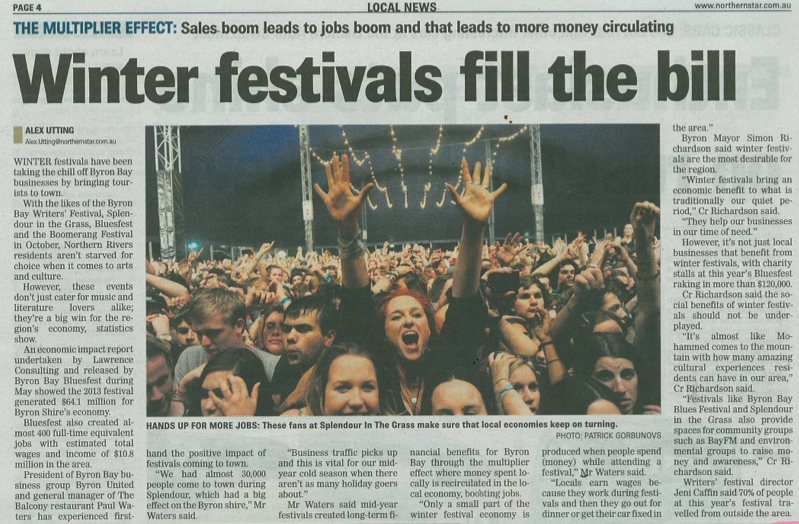 In 2013, 93.9% of Byron Bay patrons chose the offset ticket, compared to 55.2% of Marion Bay (Tas) ticket buyers. Collectively, Falls Festivals contributed $79,954 to the Tasmanian Native Forest Project. Since the Byron offset is so popular and local is always best- have you investigated using carbon offset funds to support local projects, perhaps the Koala Connections Program or other koala supportive tree planting projects? Great successes have been made in getting the off site issues resolved, now, more time can be spent to make on-site areas as brilliant as possible. As I know the organisers and whole crew are committed to this, I have complete confidence this will occur. 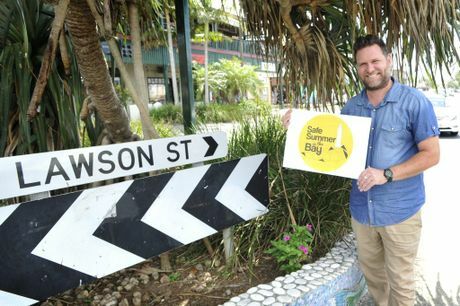 A new strategy for Byron Bay has seen the town avoid problems it has faced in previous summers. For the second year in a row, the Shire Council worked with service providers and sponsors to provide street entertainment, park and drive services, and altered traffic management. The Mayor Simon Richardson said rubbish on beaches on New Year’s Day has halved, local residents are reclaiming their town, and the strategy is proving to be a resounding success. “What we want is for the visitors to stay longer, and spend more,” he said. “But more importantly respect the community that is here, and seek to fit within it, rather than see us as an amusement park for their gratification. Cr Richardson said the changed approach has re-engaged local residents, encouraged visitors to stay longer and saved tens of thousands of dollars. “You need to have some integrity of your place to make sure someone doesn’t drive past and go to something else,” he said. “So for us, it certainly makes economic sense to be proactively sharing and celebrating who we are. Byron Bay might be losing its New Years Eve party town image after reports of a fairly incident-free night are anything to go by. Acting police inspector Adrian Telfer from the Tweed-Byron LAC said that to his knowledge there were no arrests in Byron Bay during the evening’s celebrations. He also said that the 30 to 40 police staff who were present in the town were not the only ones to have a quiet time, as it was in general a peaceful time across the state as similar reports had come from other precincts. The hospital still had a hectic night as is expected every year. ‘Byron District Hospital Emergency Department (ED) doctors and nurses had a busy new year period with a total of 153 presentations over New Years Eve and New Years Day’, said a spokesperson for the Northern NSW Local Health District. 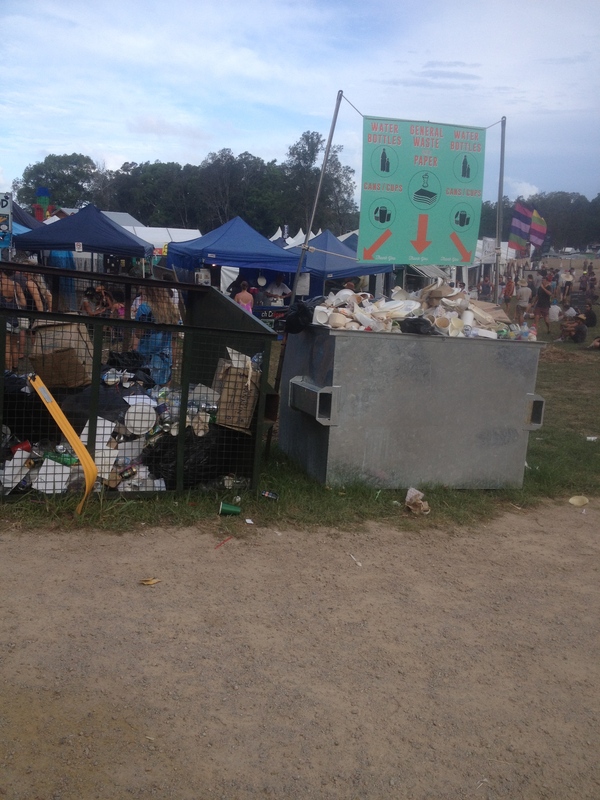 The Byron annex of the Falls Festival was also very chilled by all accounts, despite a 26-year-old Brisbane man being found dead on the morning of December 31 at the festival campsite. A post mortem is yet to be released. Acting inspector Telfer said that there was an unconfirmed report that there were no sniffer-dog-related arrests at the north Byron event. Byron’s New Years Eve was reclaimed by the community, resulting in a peaceful, friendly and fun evening for residents and visitors, mayor Simon Richardson says. ‘With a showcase of street artisans, music and dance, it was a celebration for the whole family. Most significantly we had no arrests on New Years Eve. He said that traffic was relatively light coming into town from Ewingsdale Road and that the town clean-up crews reported less rubbish left behind than in previous years. ‘They started in the early dark hours of the morning and in between the storms managed to get the rubbish off the streets and open by 7am – a pretty good effort! ‘This could not be achieved without the support of such groups as the local police, Byron United (business chamber), Northern Rivers Arts, Byron Liquor Accord and Falls Festival Byron Bay,’ he said. How did this New Year stack up? 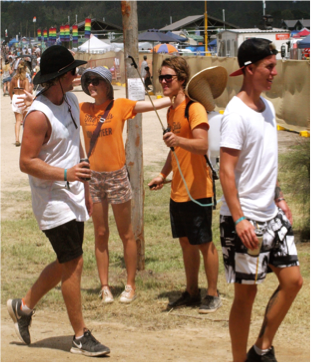 Each New Year Byron Bay faces an onslaught of visitors and locals wanting to relax, party and have a great time. 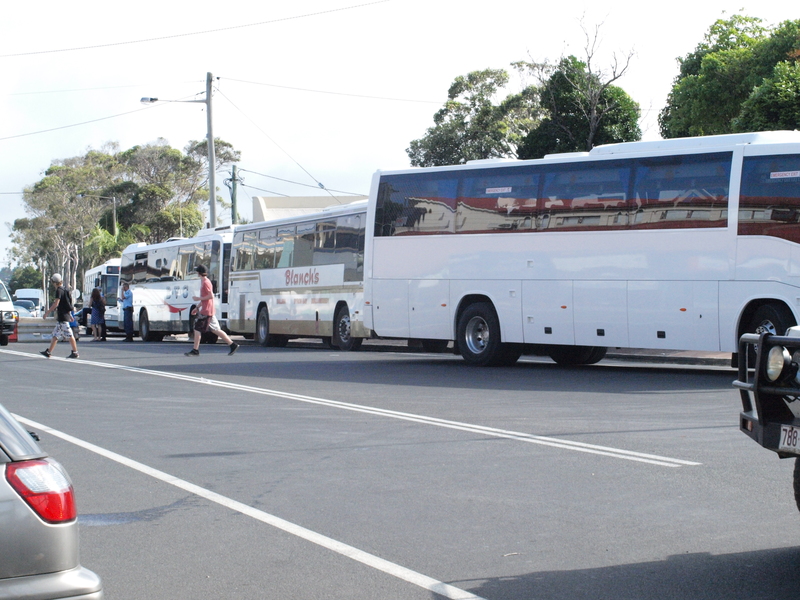 Byron Shire Mayor, Simon Richardson said, “This influx always presents a host of issues including traffic delays, illegal camping, excessive rubbish and drunken disorderly behaviour, leaving locals feeling estranged from their own town. Soul Street – Mayor Simon Richardson attended the event with his family and said, “Soul Street 2014/15 continued the brilliant atmosphere of the previous year to again, provide a space for locals to reclaim their town and families and friends to meet, a place to showcase the artistic fabric of the shire and for visitors already here, a place to enjoy the best of who we are as a community. Rubbish – Environmental Programs Officer, Lloyd Isaacson said that while the load coming into the station from across the Shire came in at 7.5 tonnes, overall the town was much cleaner. “A representative from Council’s waste collection contractor advised that this year has been the best that he has seen in the last 20 years in the Byron Shire. 7.5 tonnes sounds like a lot, but when you consider that on New Year 2011/12 there was 15.5 tonnes and it was 48 hours before it was clean, you can see that’s less than half the total waste. Infringements – Director Corporate and Community Services, Mark Arnold said, “Council issued $161,397 in fines for a range of offences including illegal parking, illegal camping, obstruction, and consuming alcohol in prohibited areas. This includes a reduction in parking fines due to the reduced Special Event Parking Area. Illegal camping activities continue to be a challenge for the Shire, and Council encourages resident and visitors to report illegal camping activities on 6626-7000 or council@byron.nsw.gov.au, so that appropriate actions can be taken. If you have any great ideas on ways to manage any of these or other local issues, or big ideas you’d like to share please go to our interactive map and make your suggestion www.byronbayourplan.com. This portal is open until the 19th of January 2015. All ideas will be considered in the Byron Bay Master Plan. 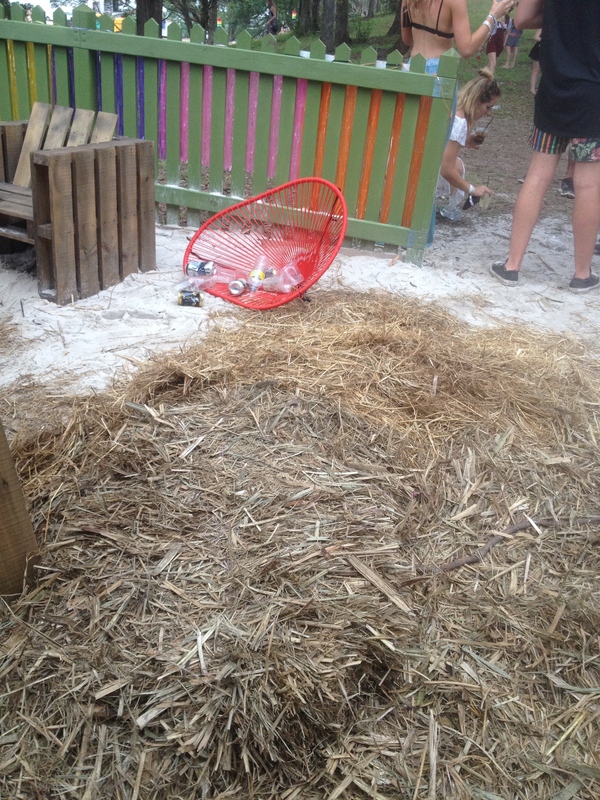 Well, Splendour in the Grass has come and gone for another year and thus, now the dust has settled (which is better than, ‘now the mud has dried’) it’s appropriate to have a look at what worked well and what needs improving. Shortly, there will be more formal debriefs and data and information shared; especially by police, NPWS, RMS, Council rangers etc. With this in mind, this summation will focus more on my own observations and on those aspects mainly on site. With Northerly winds up, especially on Friday night, many in the North of the Shire, in fact, probably half the Shire could clearly hear the event. Some in fact, could hear the bands speaking to the audience! Many were subjected to an extremely deep bass sound. Whilst it did not bother most, or at least most begrudgingly put up with it, there are some serious concerns for people close to the site, the duress they suffered and the noise does need addressing. The Council switchboard had about 7 phone calls on Friday afternoon regarding noise. This is the main issue that the organisers have to work on for next year. Wow- compared to last year, it was like chalk and cheese. The traffic into the site flowed near perfectly, there seemed to be virtually no impact on the road and very little congestion. All in all, this was a terrific improvement. The $2 million investment on composting toilets should be applauded. We must support and acknowledge innovation and sustainable practices to embolden organisers and others to continue along this path. Though there will always be lines and some using the nearby bushes, my only suggestion would be for the toilets atop the hill looking down the amphitheatre to move back 5-10 metres, as the slope next to the urinals and walking path was extremely slippery and a tad unsafe. I hope the managers of the rubbish spent plenty of time observing how the bins were used. Though generally fine, some were regularly overflowing, whilst others were rarely used. Bottom line is that bins need to be where people will use them, in the numbers needed and be emptied when full. I would also urge that, at say 10 pm, a wave of vollies clean the food areas in time for the last wave of punters rather than wait until the end. For example, the beautiful grassed area adjoining the food area near the main amphitheatre was covered more with rubbish than people at times. Why is this so important? Evidence shows human behaviour improves when they are in better spaces; even homeless people treat an area better if it is well maintained. A well-maintained area signals to people that they are in a respectful place and thus they engage in less anti-social behaviour. This is especially so later in the night when festival goers are a touch more ‘carefree’ than during the day. The space sets the standard. Communications between nearby residents and the site were vexed, with many struggling to get through. I received calls by those wishing to lodge complaints regarding noise who stated they were not able to access the complaints number due to the failure of VOIP (Voice Over Internet Protocol – much cheaper phone system). It is incredibly hard to provide 100% perfect access and, though better this year, more needs to be done. Telstra and other service providers must be pressured to provide adequate services for our region. We are a major tourist destination, promoted by various levels of Government, and at any given time our population is increased dramatically, which in turn requires a much better level of service from all providers. On site in my experience, the coverage was generally fine. It was brilliant to see the new showers use vastly less water- a great environmental outcome. Shortly we will find out exactly how many less litres of water was used- it will be pleasing reading. Council rangers were out and about booking a few illegal campers in Byron, but very few were reported. Rangers reported a ‘quieter than normal’ weekend. Night patrol ran from 10pm to 7am (Fri, Sat & Sun) and a morning shift from 7am to 4pm (Fri, Sat & Sun) plus parking officers. 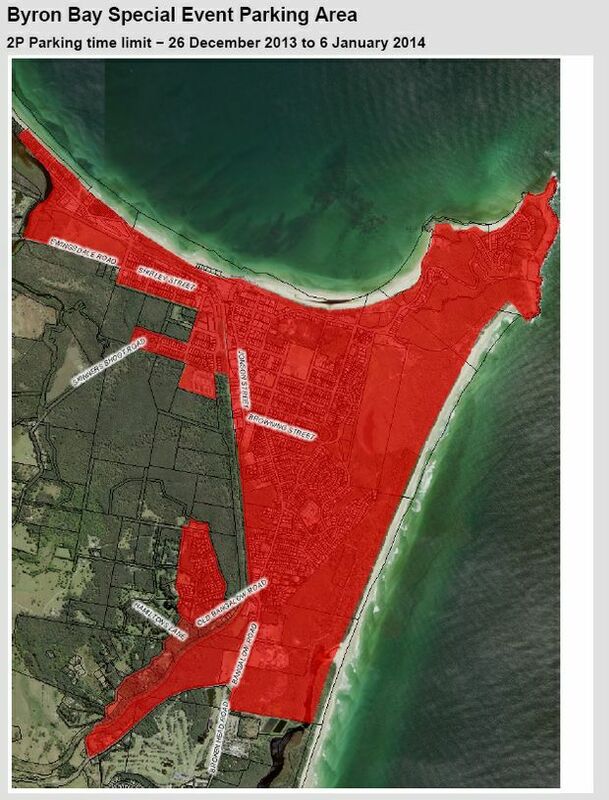 Areas patrolled included the north of the Shire and three fines were issued on illegal camping in Byron Bay. Rangers did report increased cars parked in the northern towns, however the cars were parked in unrestricted time areas and the occupants were catching the shuttle buses to the site. 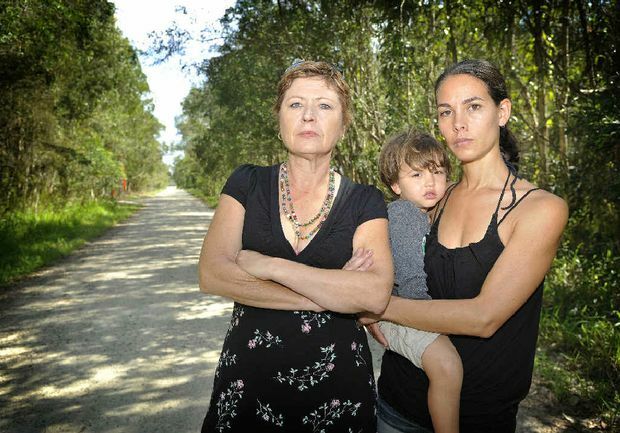 There were also numerous complaints re camping behind South Golden Beach Community Centre (on Crown Land) – complaints were referred to the Lands Department in Grafton for investigation. Ranger attended on Sat morning and the group, who were found to be local young people, moved on. Local Involvement within the Festival. It was incredible to see how many locals work, perform and sell their wares at the festival. 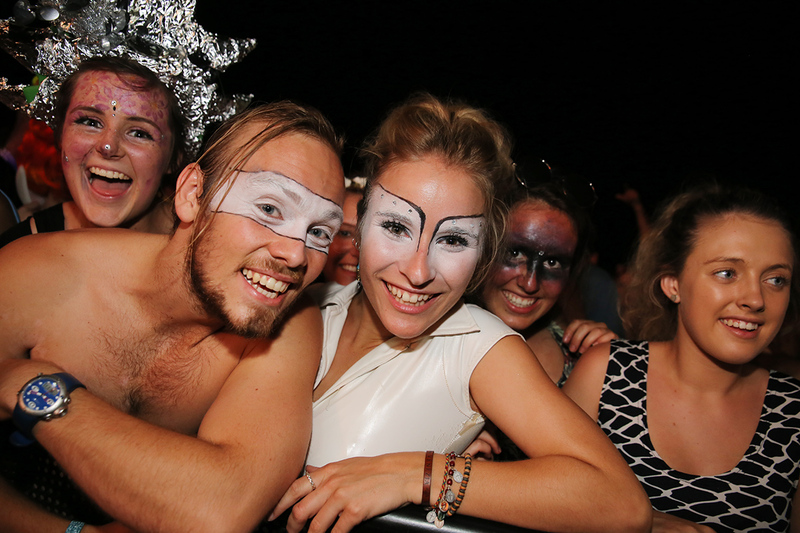 Alongside the thousands who attend, the benefits for those who are part of the festival are massive. One area that could improve is in the food vendor area. I would guess that the vast majority of food vendors were not locals. It seems the presentation and aesthetics of the stalls are considered highly-and this is a good thing. However, if this is a reason why many locals can’t get in, perhaps the organisers can help them improve and professionalise. By raising the bar, but helping locals hurdle it, they would be helping food vendors improve their on-going business practices. I would guess that the group making these decisions might not be local and simply support long time vendors whom they know. It would be great if organisers made a commitment to increase local participation in providing food. We already do it brilliantly at other festivals and markets across the year and with organisers support, dozens of food businesses can receive a much needed winter leg up. The organisers improved upon most of the aspects from last year. Internally, the site was beautifully laid out, the amenities were excellent and the music, art, theatrical performances and spaces were awesome. Special mention must go to the largely local Global Village- this space rocked this year! The vast majority of punters were well behaved and had a ball and the atmosphere was positive and truly festive. Externally, more needs to be done with noise and supporting the nearby towns with rubbish proliferation. Each year provides an opportunity for improvement; which is where community feedback comes to the forefront. The site has an approval in place for five years and we’re up to year two. Looking back is always informative, however it’s how we can take that knowledge and find a balance for locals, creativity, employment and the environment, that is the opportunity. Splendour In The Grass‘ World Environment Day Award-winning sustainable toilets have been officially unveiled, with event grounds North Byron Parklands announcing the completed installation of the largest number of waterless composting toilets at any Australian outdoor event. The state-of-the-art toilets are a result of lengthy arbitration between the grounds and Byron Shire Council, which had previously expressed concerns over Splendour’s sustainability. However, the Parklands have more than risen to the challenge, aided by Council’s approval for 258 of the waterless toilets to be installed at the grounds. 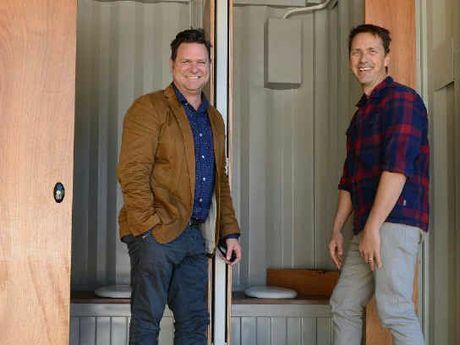 So far, in conjunction with Aussie-owned company Quicksmart Homes, 240 of the customised, sustainable units have been constructed, as well as 192 environmentally smart shower stalls. With another six pilot composting toilets already constructed last year, North Byron Parklands now hosts a pretty incredible 246 of the sustainable latrines. Mayor Simon Richardson with Parklands general manager Mat Morris outside one of the new blocks. 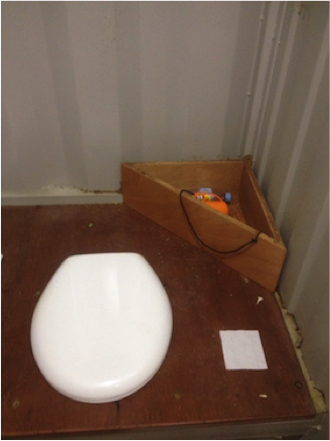 The relocatable toilets instantly beef up the festival’s pro-environmental cred, with their existence going a long way towards significantly reducing the amount of waste water sent to the Byron Shire Council’s sewerage treatment plant. It would seem Council appreciates that fact, too, having also recently approved the Parklands’ request to expand their existing grey water treatment facility (on which punters’ shower water is reliant) – meaning it can now treat up to 920,000 litres of grey water without leaving the grounds. “While the vast majority of outdoor venues rely on transporting hundreds of port-a-loos and showers to and from site, Parklands has delivered an infinitely more sustainable solution that resolves many of these transport and waste disposal issues,” Parklands general manager Mat Morris said in a statement. Not a second too soon, either – Splendour In The Grass 2014 goes down next weekend, with the grounds opening up for first campers on Thursday before the event gets in gear proper on Friday. IT WILL have some of world’s most popular bands, but Splendour in the Grass now has something else to boast about – loos with a view. The North Byron Parklands festival site at Yelgun yesterday unveiled the largest number of waterless composting toilets at any outdoor event in Australia. 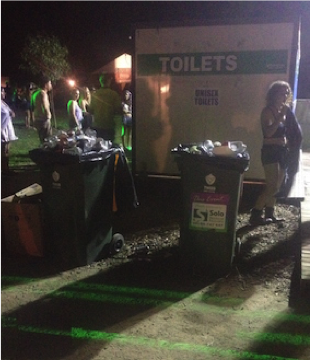 Splendour punters will be the first to experience these state-of-the-art, waterless and low-odour composting toilets. And it gets better – while you’re waiting in line, you can catch a glimpse of the ocean over the rolling hills. Byron Shire Council gave Parklands approval for 258 toilets in 2013, and now 246 waterless units have been built, designed and commissioned by Quicksmart Homes. They are relocatable and will help to reduce wastewater truck movements. The general manager of Parklands, Mat Morris, said it was an “infinitely more sustainable solution”. “While the vast majority of outdoor venues rely on transporting hundreds of port-a-loos and showers to and from site, Parklands has delivered an infinitely more sustainable solution that resolves many of these transport and waste disposal issues,” he said. 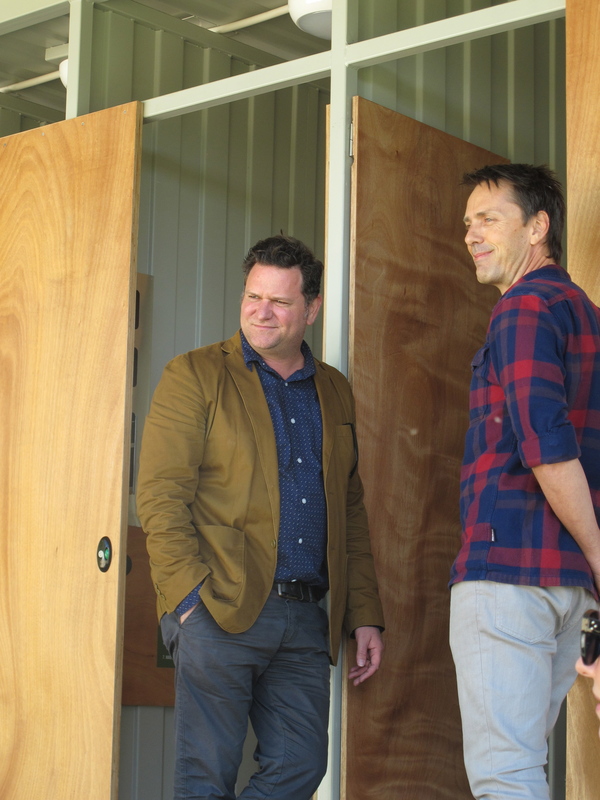 Byron Shire Mayor Simon Richardson said the new toilets were an initiative that celebrated innovation. “Hopefully other events and other people with the capacity to promote and develop innovative practices get inspired by what’s been done here. “Parklands has shown courage and commitment in what they’ve done. Cr Richardson would be attending Splendour, but said he found it hard to “switch off” from his civic duties. The inaugural Falls Music & Arts Festival at the North Byron Parklands site, Yelgun, is being hailed as a big success with ‘mellow’ and smiling crowds enjoying the smorgasbord of performers, in mild, balmy weather. 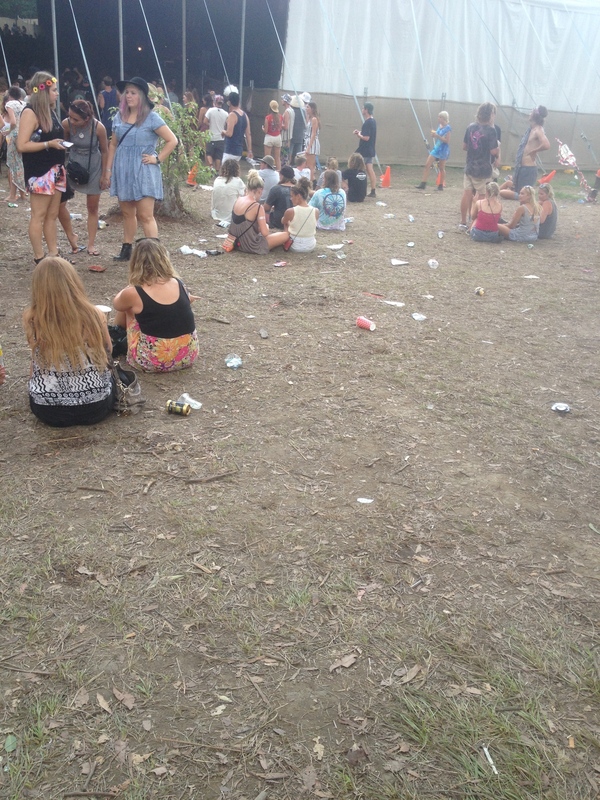 Regular Byron festival-goers say the new layout of the venue, home for the larger mid-year Splendour in the Grass festival which was also held there for the first time in 2013, was a huge improvement. 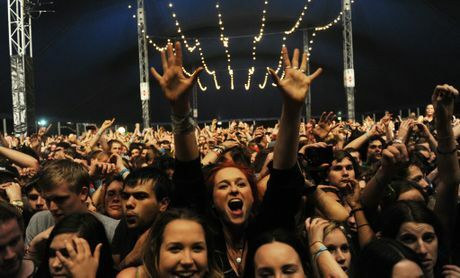 Traffic snarls, bus delays, long queues, long walks and longer waits, which marred the last Splendour festival, were a thing of the past for The Falls, which contributed to the easygoing atmosphere there during the past three days. The natural amphitheatre set in an undulating valley on the site easily and comfortably catered for the thousands and thousands in the mostly interstate crowd and was the feature’s open-air improvement of the new site, still being transformed. While more than 12,000 people plus so far have enjoyed popular international acts such as the The Roots, one of the biggest hip-hop acts in the USA, Vampire Weekend and The Cat Empire, the festival finale today and tonight also has major drawcards such as Violent Femmes, Neil Finn, The Wombats and MGMT. Meanwhile, New Years Eve celebrations around the region appeared to go without a major hitch as police reported well-behaved crowds at all major tourist spots on the north coast. 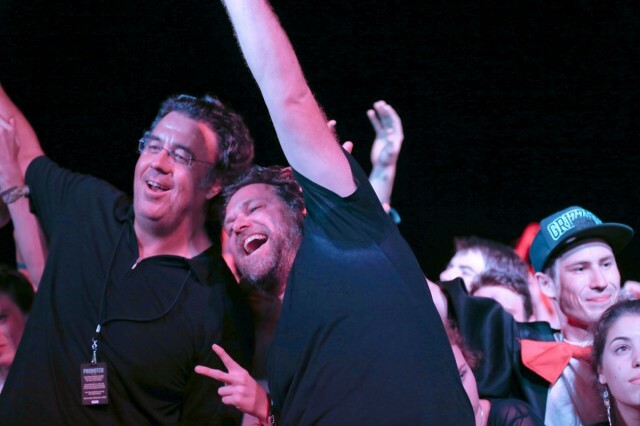 The Falls Music & Arts Festival director Brandon Saul, left, and Byron Shire mayor Simon Richardson celebrating New Years Eve at The Roots concert. In Byron Bay, 19 arrests were made for antisocial behaviour and two police responding to a melee on Main Beach around 11pm escaped injury after they were hit with beer bottles thrown by some drunken youth. A police vehicle window was also broken in the isolated attack. That was the major reported incident in an otherwise peaceful event on the north coast’s main tourist mecca, where thousands of youth from all over Australia and around the world celebrated with local families. Hospitals around the region also reported a normal mid-week night with no rush of patients to deal with over the night at Byron, Ballina, Tweed Heads, Murwillumbah, Lismore and Mullumbimby. 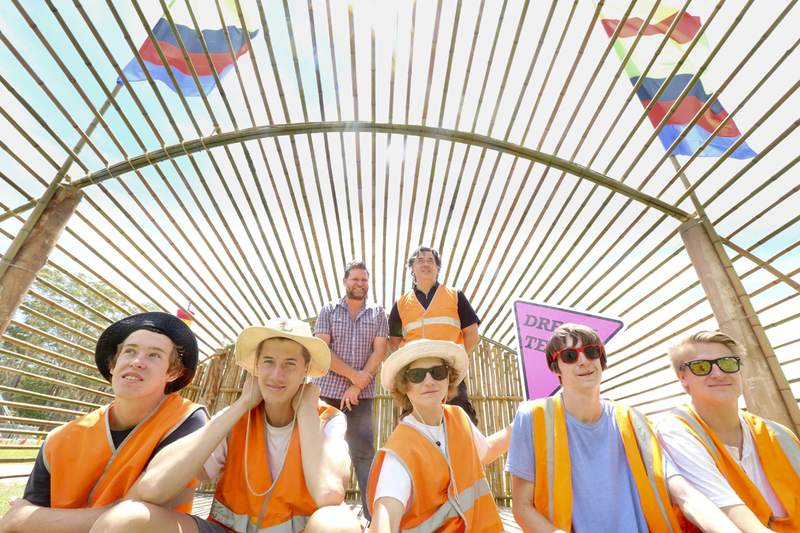 Falls Festival young events management trainees (front) Jaden Moffitt, Reade O’lauchlan, Hamish McKenna, Jackson Bailey and Jara Larter with (rear) Byron shire mayor Simon Richardson and festival director Brandon Saul. The six young trainees are involved in the festival’s youth training program to develop skills in construction, carpentry and event preparation after they were referred by the Byron Youth Service. The trainees have been busy working alongside the festival team at the site building the bamboo Guerrilla stage near the Arts Village. Photos Jeff Dawson. 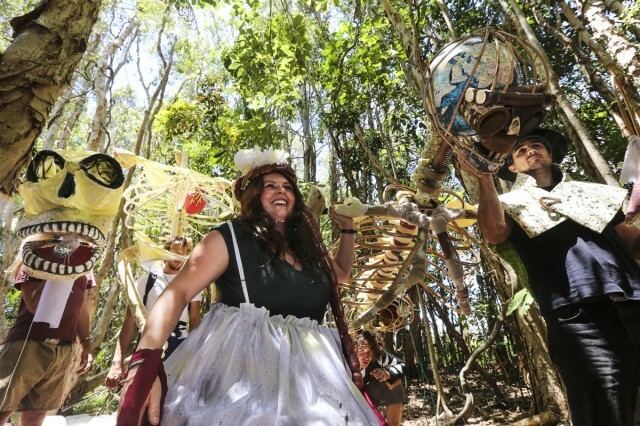 Around 3,000 Byron and Tweed shire residents will be among the 12,000-plus people expected to attend each day of The Falls Music and Arts Festival at the North Byron Parklands site, Yelgun, from New Year’s Eve to Thursday, January 2. 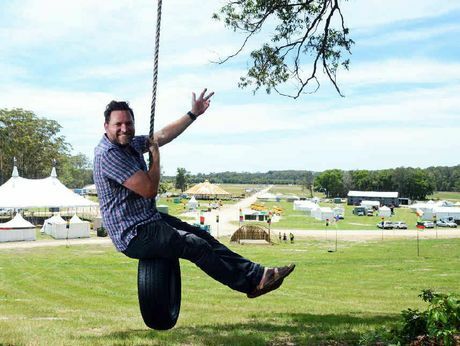 Preparations for the festival being held in NSW for the first time are going full steam ahead at the purpose-built event site at Yelgun which started its life six months ago as the home of the Splendour in the Grass festival, which also draws thousands of people to the area. A special allocation of tickets for locals sold out this week, complementing a big bill of local performers which has thrilled organisers who say some local acts could end up being a highlight. Big crowd pullers will be, from the US, The Roots, The Violent Femmes and Vampire Weekend and from Australasia, Neil Finn and Cat Empire. Falls Festival director Brandon Saul the sellout of the local allocation tickets meant many from across the northern rivers were choosing to come for the whole festival and others ‘to spend their New Year’s Eve with us. ‘We’re really looking forward to putting on a great festival, Byron style. It’s also great to have so many locals performing at the festival. I suspect this section of the festival may end up being a bit of an unexpected highlight – it’s like a “festival within a festival”,’ he said. An unholy trinity of local performers and artists set to entice, entertain and enlighten Falls Festival patrons with the wicked delights of the Shire. Wacko, Mae Wild and Joel Salom along with over 100 local performers will conjure a creative, and slightly warped, oasis in the Village area between the two main stages. A big part of The Falls Music and Arts Festival is a diverse program for The Village area of the festival. Organisers say the line-up ‘presents a labyrinth of performance-based art that continues to grow bigger every year, physically and metaphysically’. ‘With artists and installations from across Australia and the world, The Village is a space packed with an organised kind of chaos, loveable characters, enchanting music and charming surrounds,’ they say. 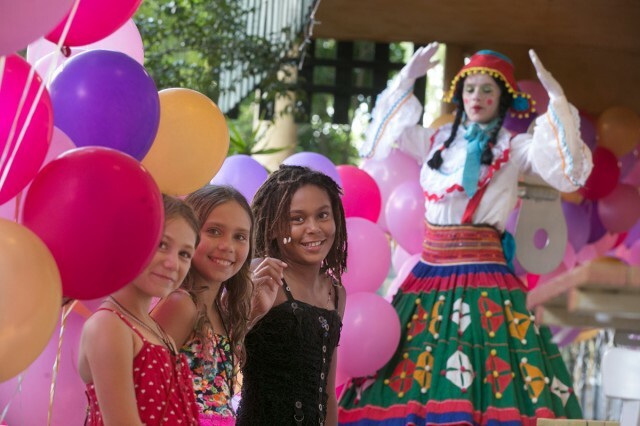 Another festival highlight is the Falls Fiesta, an ‘effervescent extravaganza on the last night of each event, which entails a colourful explosion of dancing and costumes with a huge parade designed to bring everyone together’. Puppets and sculptures created throughout the art camps before and during the events lead the parade to party music. This year Council is working closely with police and the community to bring together a New Year to remember – for all the right reasons.Council met with Police to establish a management plan for New Year’s celebrations in Byron. “Families need to feel safe if they’re coming into town for New Year’s and I’m glad I can say that it will be safe now,” Mayor Simon Richardson said. “Police have said they’re committed to having more police on the ground, targeting trouble spots like Apex Park and Main Beach, working more closely with our rangers to put a lid on street drinking and illegal parking. They’ll also help ensure the transit lane in Shirley Street stays clear for buses and direct communication will be established between all major players of New Years; Soul Street, Park and Ride, First Sun, Rangers and Police. “Our great community, including the Community Centre, Byron United, and other businesses and the Liquor Accord have all come on board to help provide family friendly entertainment and beautify the streets. These are important relationships and it’s great to see the community coming together in this way.” Mayor Simon Richardson said. Mayor Simon Richardson concluded, “After the fall out from last year we listened to what the community had to say. We liaised more closely with Byron United and the business community, the Byron Community and Cultural Centre, local police, youth groups, Falls Festival and the public. Some of the Byron Bay New Years team bringing you Safe Summer in the Bay, director of Byron Youth Service, Di Marney, Byron Market director, Tess Cullen, Vice President Byron United & Evolution Concierge, Jodie Molloy, Byron Shire Council Community Policy Officer, Mayor Simon Richardson, chair Byron Liquor Accord, Hannah Spalding, CEO/Regional arts development officer, David Wood, creative producer Byron Community Centre Mouche Phillips, director Fall Festival Byron Bay, Brandon Saul, manager Byron Community Centre, Paul Spooner, Backpackers Group representative, James Robinson-Gale, Sgt Jack Keough, Tweed Byron Local Area Command. The Last Drinks at 12 coalition has taken the extraordinary step of opposing Byron Shire Council’s plans for a safe and sober family New Years Eve. The group has described the council’s measures as a ‘very costly, reactive approach’, which they say will do nothing to help prevent ‘the high levels of intoxication after midnight’. And they have gone even further, attacking Byron Shire mayor Simon Richardson personally for his roadblock plan, arguing that even though it had worked successfully before it would have had ‘implementation’ problems this time around. The RMS withdrew its permission to maintain the roadblocks out of concern it would lead to increased traffic problems on the Pacific Highway. Mayor Richardson said he was ‘mystified’ and ‘disappointed’ by the comments, from a group ‘I agree with 99.9 per cent’. ‘Byron Council’s campaign for a safe summer in the Bay fails to address the key element of alcohol-related violence: the oversupply of alcohol after midnight,’ the group said in a media release yesterday. ‘Cr Richardson’s proposed strategy of closing off roads into town was successfully implemented in the 90s. However, in 2013, this strategy was known to have implementation problems. There was always doubts that Council would get the necessary authorities required,’ they wrote. ‘Mayor Richardson maintains Byron Shire was trying its utmost to ensure that the trashing of the streets and antisocial behaviour does not occur this New Years Eve. ‘Yet instead of adopting proven, cost-saving measures to help prevent the high levels of intoxication after midnight, the mayor has resorted to the very costly, reactive approach of more police to pick up the predictable pieces,’ the group wrote. Cr Richardson said he was mystified by the group’s attack. Last Drinks at 12 said the inclusion of Cheeky Monkey’s this week on the state’s most violent venues register was evidence ‘our Council is still not focusing on what needs to occur’. 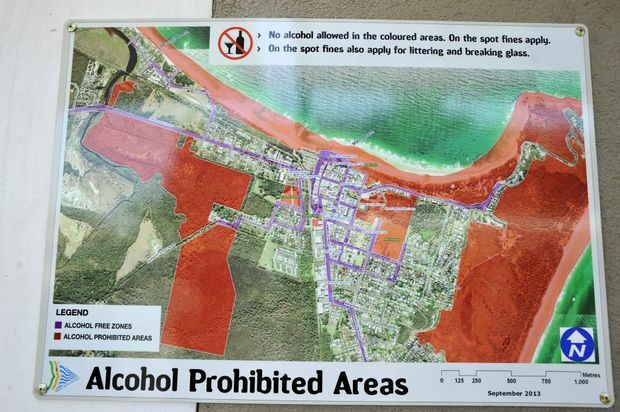 ‘If Byron Shire Council really wants to make Byron Bay a “family-friendly”, chilled-out place to celebrate NYE, it needs to address the basic causes of alcohol-related harm: the late-night oversupply of booze. ‘The antisocial behaviour caused by extreme drunkenness is not a problem that will be solved by extra police. The police themselves have acknowledged this repeatedly. But Mayor Richardson said the council was doing everything it could to dampen down late-night partying in the town over New Year’s Eve and that changing the licensing provisions of late-night venues was not within its power. ‘The granting, the monitoring, the withdrawal or not of liquor licences, none of them are within our scope of power,’ he said. ‘If you want to change the drinking culture to have as one of your first ports of call New Year’s Eve is a very big ask. New Year’s Eve is one of those nights that people who may never drink all year have a drink. The group will be holding a meeting of members and supporters at the Byron Bay Community Centre today from 4pm to 6pm. 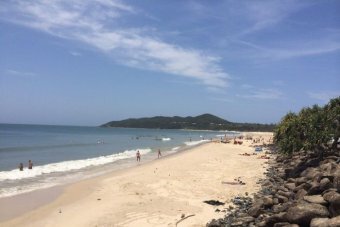 Carefully laid plans for a safe and family-friendly New Years Eve in Byron Bay are in tatters after Roads and Maritime Services (RMS) have withdrawn permission for roadblocks at entry points to the town. The refusal has left Greens mayor Simon Richardson seeing red and calling on more police to be rostered on to man the roads leading into Byron, prepared to turn away the kind of drunken rabble that trashed the town last New Years Eve. Mayor Richardson is hoping to meet with the police commissioner and the emergency services minister to press his point. He has already booked a meeting with local police early next week to ‘see what they need, how Council can help and be reassured necessary police numbers will be on the ground’. The call comes the NSW Police Association has itself backed the campaign by local community groupLast Drinks at 12 to have the Independent Liquor and Gaming Authority intervene in Byron Bay to prevent the expected escalation in alcohol-related violence and harm in Byron over the Christmas–New Year period. This news comes as Byron’s Cheeky Monkeys and Lismore’s Cocktails bar were today named equal third most violent venues in NSW, with 16 violent incidents each in the past 12 months. Last Drinks at 12 have requested an urgent community conference of all local stakeholders before Christmas chaired by the ILGA chairperson. Scott Weber, the president of the NSW Police Association, has written to the head of ILGA, Chris Sidoti, endorsing the Last Drinks campaign and asking that he ‘urgently consider the concerns and requests of the Last Drinks at 12 community group, to pre-emptively avoid tragedy before it happens’. Despite the RMS refusal, the Council will push ahead with its plans for a more family-oriented celebration, moved from the beach to Jonson Street, and ending at 10pm. ‘The Community Centre’s creative flair will highlight Byron’s character as a chilled-out community that embraces colour, dance, humanity and the environment,’ Mayor Richardson said. Music festivals – a magnet for reprobates, degenerates and all manner of trouble? Or a proven way of keeping the peace? The real answer might surprise you. Amid the announcement that the Falls Music and Arts Festival will be extended to Byron Bay for the first time this December, is the news that the local mayor counts it as a crucial part of Byron Shire’s “risk management strategy”. Byron Bay is a well-known hot spot for alcohol-related violence each New Year’s Eve. 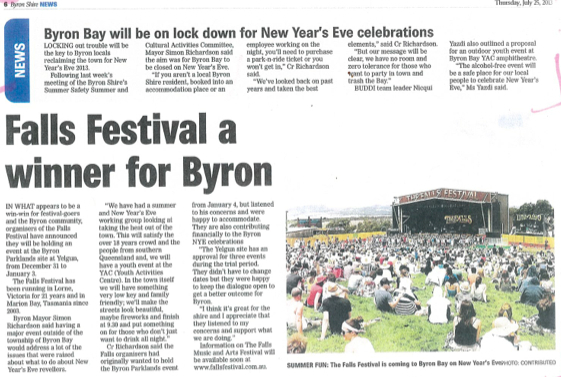 Mayor Simon Richardson described the arrival of the Falls Festival as “a crucial piece in the community safety and cultural program jigsaw” of Byron Shire because it would give 18-30 year olds something to do at a “controlled licensed venue”. Who better to ask if such a plan might work than the police? Before the Rock Above the Falls festival began there in 1993 Lorne, Victoria, was a town with more than its share of unruly drunken incidents, often involving local youth. Sergeant William Matthews, of Victoria Police, said the festival had a positive effect on law and order in the coastal town on the Great Ocean Road. “The presence of the festival has seen a decline in the number of incidents and injuries occurring on the Lorne foreshore resulting in decreased pressure on services such as Victoria Police,” he said. Cr Richardson said after the “challenges” of New Years Eve, stakeholders had worked together to create “a safe, creative, community focused response”. The festival will run from December 31 until January 3 at North Byron Parklands, but the artists playing have not yet been announced. 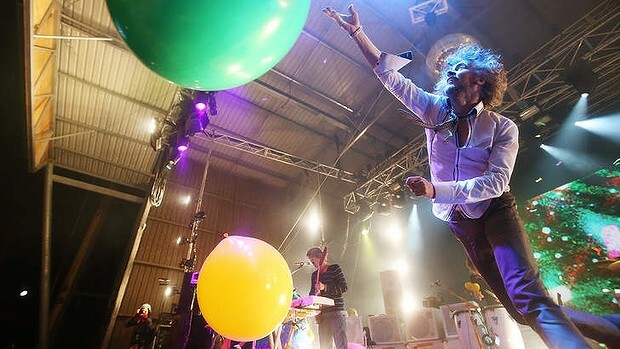 Last year the Flaming Lips, Hot Chip and Coolio headlined. It will also be held at Lorne, Victoria (December 28-January 1) and Marion Bay, Tasmania (December 29-January 1). What sort of New Year’s Eve do you want? Summer fun that is safe and reflects the cultural creativity of Byron Shire will be rolled out for New Year’s Eve 2013 and beyond. To be part of the planning, Byron Shire Council needs community members for its Community Summer Safety and Cultural Activities Committee. Mayor Simon Richardson said the purpose of the committee was to help with a ‘safety’ focused New Year’s Eve strategy and summer holiday period. “We are a creative community with a very strong social consciousness and Council is aiming to bring the experience and ‘will’ of our residents to the table and help put together a solution,” he said. To help with the festivities, Council last month reallocated just under $10,000 from the Schoolies budget to assist with New Year’s Eve celebrations. The summer holiday period strategy will be based on community inclusive cultural activities and events in the Byron Shire and in line with Council’s recently adopted Safer Communities Compact. Mayor Richardson said Council’s involvement with the successful Schoolies Safety Response Strategy will also see the lessons learnt from that event, applied across the peak holiday period. Committee members will have established ties to the Byron Shire community, interest and/or professional experience in community safety and/or cultural activities or events, and previous experience on other committees or boards. Meetings will be held bi-monthly. The term of appointment for committee members is twelve months and appointments are in a voluntary capacity. Submissions should be in writing and addressed to the General Manager, Byron Shire Council, PO Box 219 Mullumbimby 2482 or sent by email to council@byron.nsw.gov.au. Now the dust has settled it is time for a serious and sober consideration of what occurred and what larger picture decisions and strategies should be developed. Clearly, most of the people in town in Byron Bay had a wonderful experience and treated themselves, others and the town relatively respectfully. However, far too many had nowhere to stay and so slept wherever they felt; far too many had no desire to spend time in town and so spent all their money on grog and preloaded in packs and; far too many had no respect for the town and so treated it as a theme park and trashed it. It is vital a strategic approach to NYE is undertaken. About five years ago, Jan Barham and a half dozen others worked to create a low key NYE celebration consisting of music, stalls, an amusement area and later, a light show. It stemmed from a desire to provide something for those already in town who shied from the increasingly prohibitive entry costs to venues. It was based on the understanding bthat it was not to bring any extra people to Byron Bay, and thus was not promoted widely. I stage-managed and M.C’ed two of these NYE events and they were wonderful experiences for everybody. It is clear that this model of celebration has been out grown as people are now coming into Byron precisely for this entertainment. When once there may have been 3-5,000 people in the park, estimates now put the numbers at between 10-15,000. 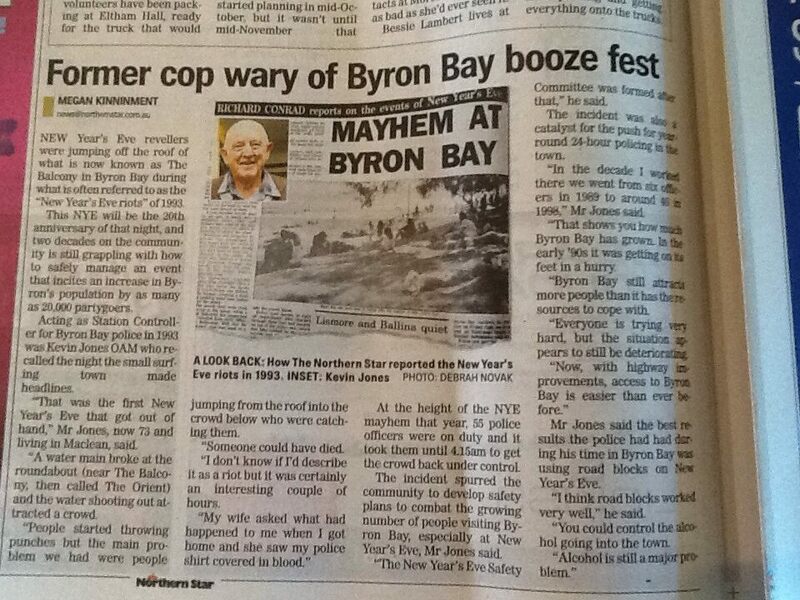 Clearly, thousands are coming to Byron purely for NYE. As Lismore and surrounding areas did not provide a NYE focus and appear not to do so in the future and as word gets out amongst the young adults in Queensland, next year will only be bigger. Another 10% increase in numbers and hostility next year and we may have a seriously dangerous and damaging night on our hands. Thus we are faced with choices to spend more money for mainly visitors to provide more entertainment, security, waste collection, rangers- or consider the needs for residents. Spending more money would be unpalatable for many who could think of other ways Council could spend resident’s money. Thus, it is perhaps time to reconsider what we as a community want to provide on this night. Personally, I think finishing up at 9.30 should be considered. We can provide family friendly entertainment, have better quality fireworks and finish well before 12. Then, locals may feel more safe to bring their kids and themselves into town, enjoy early evening entertainment and leave to either head home or enjoy meeting friends elsewhere. Word will quickly get out that the Byron NYE theme park is no longer open for business and the extra visitors unable to be absorbed this year, will diminish. We need to ensure Council’s commitment to NYE is for a low-key, family friendly, resident focused celebration. The residents of Sunrise, Belongil, Suffolk and Byron deserve it, the responsible visitors deserve it and our town deserves it. Brilliant, you’re totally on track Simon. Bravo. Great article Simon, even though my family and I were away for NYE I was saddened to read about what happened. I agree, perhaps it would be better to end activities at 9.30pm for the whole community’s sake and a team of rangers to issue heavy parking fines for all those illegally camping in streets where signs clearly say not allowed. I agree totally-but think that we maybe should not have fireworks at all — Early Lazer show again from the beach, it was rubbish coming from behind while all the families were facing the beach.? Nothing to attract the BOGans, we did stop them coming before remember? Maggi. I didn’t go as I can’t handle so many people anymore however I agree with Simon and Maggi (fireworks are expensive). Have musicians and other buskers on the beach promenade, and maket and food stalls until 9.30. Then people can go on to other venues if they want.